When a Pidgey walks into a bar. A wild Doduo in its natural habitat — perched on a cocktail glass at Make Westing. Hudson Bay Cafe, Blue Bottle, Rockridge Cafe, Homeroom, Pizzaiolo, Luka’s Taproom, and Cafe Van Kleef. A restaurant and bar crawl to take an Oakland newcomer from day to night? That too, but this is also a list of PokéStops and Pokémon Go “gyms” in the East Bay. A quick primer for the uninitiated: Pokémon Go is the new enhanced reality game that is taking the world — and the East Bay — by storm. The goal is to catch all of the birds, insects, and other fictional creatures available in the game. They pop up on your phone as you walk through cities but are often concentrated around the aforementioned PokéStops, where players also get more Poké Balls and other tools to use in the game. At the gyms, players fight each other with their Pokémon and attempt to take over the location for their team. Many of the PokéStops and gyms are local landmarks, libraries, murals, and other areas of interest. But quite a few lucky cafes, bars, and restaurants in the East Bay were labeled as such, all without their knowledge or forewarning. There are so many that Yelp now has a “PokéStop nearby” filter, for those looking to get something to eat while they try to catch ‘em all. Bars and restaurants can’t be blamed if they worried Pokémon Go players would get in the way: anything that has groups of people walking around outside concentrating on their phones, or standing right outside of restaurants to have virtual fights with one another, has the potential to be disruptive. A few places, West Oakland’s Stay Gold Deli among them, even put up “No Pokémon” signs. And on Twitter, the reactions of chefs to that Yelp filter were not all thrilled, to say the least. Fortunately, the game hasn’t seemed to disrupt business, and at least for some restaurants, has increased it. Jesse, a bartender at Uptown Oakland’s Cafe Van Kleef, said that there was a big gathering of Pokémon Go gamers at the bar right when the game first came out. One of the gamers said he was going to drop a “lure” — a device in the game to bring more Pokémon to a specific PokéStop — at the bar to bring more customers. It seemed to work, and players have come by in a steady stream ever since. Luring Pokémon-hungry customers seems to have caught on quickly. On a recent Saturday night, Pokémon lures were floating around outside of Luka's, Make Westing, and Pizzaiolo. At Hudson Bay Cafe, the staff has noticed an uptick in business, as well as a wider range of customers. Hudson Bay is kitty-corner from the Rockridge branch of the Oakland Public Library, which happens to be a Pokémon Go gym, so there’s a lot of activity nearby. Nathan, the manager, said that there have been a lot more people in the 15- to 19-year-old age range coming into the cafe and noted that they always buy something to drink or snack on while they play. But patrons of all ages have been playing, and many have come up to him to show him pictures on their phones of Pokémon floating around inside the cafe. 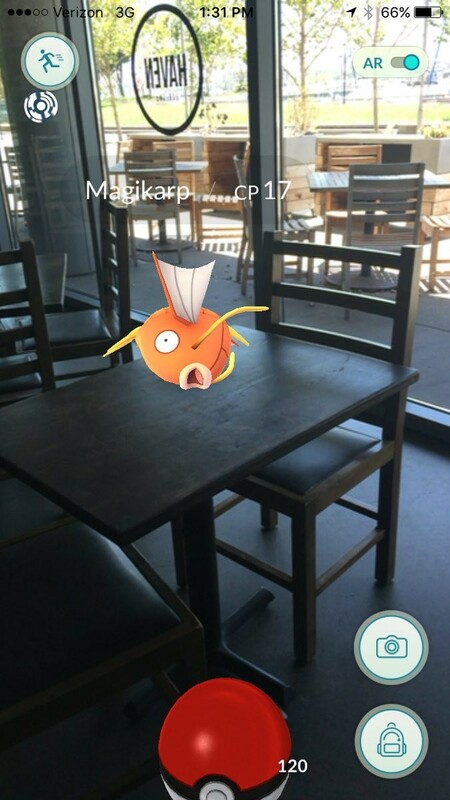 This Magikarp wasn't harmed (via Twitter @havenoakland). 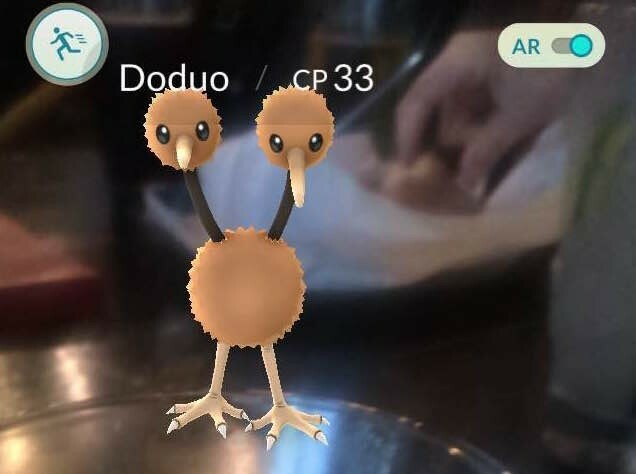 Pokémon players visit pricier restaurants too. At Haven in Jack London Square, the staff noticed people playing right away. Jack London Square has lots of PokéStops and two gyms, and Haven has seen quite a few guests come into the lounge for a bite to eat or a drink while playing. The general manager noted that many of their waitstaff play as well, so it’s a nice way for the staff and the customers to connect: They compare notes about which Pokémon they’ve caught in the restaurant, and the staff gives customers advice for where to go Pokémon hunting after they eat. The way Pokémon Go fosters collegiality among strangers is an unexpected pleasure of the game. The “But everyone is on their phones in public!” complaint is true, but it’s a game that lends itself to conversation, and one where people can — and do — help each other out. As a brand new player attending a Pokémon pub crawl in Uptown Oakland last weekend, I got advice from friends and strangers around the table about how to advance in the game. And the adult/teen interactions that Pokémon Go encourages are my favorite thing about it: On her way back from the pub crawl, TheVerge.com science editor Liz Lopatto ran into a group of teens who earnestly told her how to get a Pikachu as your starter Pokémon. The game has also made me more aware of little things in my neighborhood, like a mural I’d never really looked at and a plaque in the sidewalk I’d walked over thousands of times. And I have a pang every time I walk by the PokéStop at the now-closed Ye Olde Hut. If you’re planning to hunt Pokémon in the East Bay, make sure to stop and stay awhile at some of the bars and restaurants that got drafted into playing host to the game. Who knows, maybe that Greyhound will even help you catch a Pikachu.